Whilst the S.League heads for its recess period, local football supporters will still get the opportunity to catch some live competitive football actions during the inaugural Youth Olympics Games football competition. The national U-15 team, coached by former national defender Kadir Yahaya, will kick off their quest for glory when they take on Zimbabwe on 13th August (Friday) at the Jalan Besar Stadium before facing Montenegro on the 19th on the same venue. 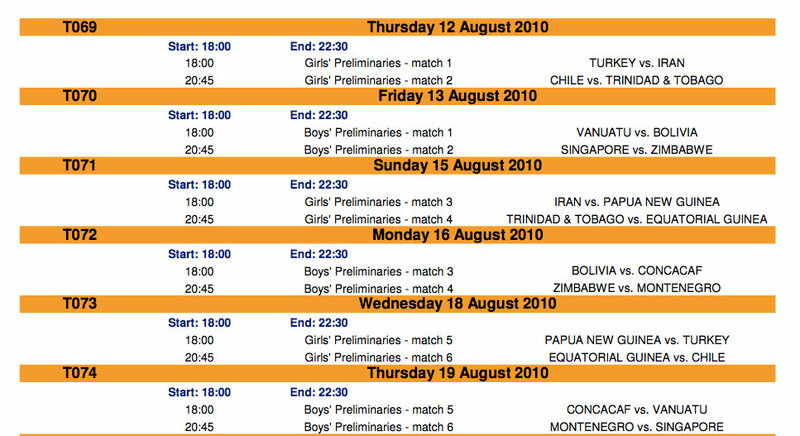 (Picture above) The schedule of the preliminaries matches of the YOG football competition (click here for a larger view) - courtesy of the YOG official site. 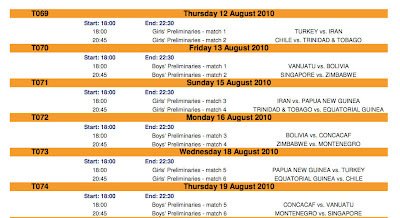 Tickets are now on sale at authorized ticketing outlets (click here for the list of these outlets) OR you may log on to the following website to purchase the tickets online at "http://www.singapore2010.sg/public/sg2010/en/en_tickets.html"
To enhance your match day experience while watching the boys in action, what could not be the better way but to wave and swing the "Singapore Scarf"!! 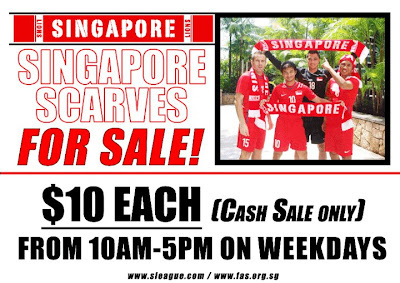 The "Singapore Scarf" is currently on sale and available at the FAS office at the Jalan Besar Stadium (as detailed in the picture above). C'MON, SINGAPORE and LET'S PAINT THE TOWN RED!! !